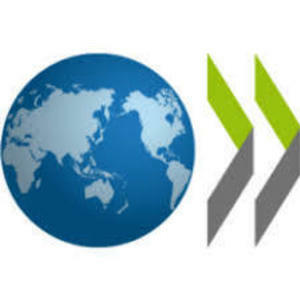 ​Geography of Discontent | The Forum Network, hosted by the OECD: Shape ideas. Shape policy. Shape the Future. The Geography of Discontent discussion highlighted that discontent is not at the margins, but at the centre of people's concerns. For families and communities, access to decent work is a foundation of stability and social, as well as personal, advancement. J. D. Taylor, author of Island Story: Journeys through Unfamiliar Britain, travelled the country on a rusty bike, meeting strangers and talking to people in his attempt to capture a sense of modern-day Britain. He reflected that in many of his encounters comments such as “there’s not much around here” or “we used to make things here” were common. He drew the conclusion that while in the past jobs in industry or farming gave a sense of purpose and pride, people increasingly find themselves in jobs they don’t want to do and without much hope for a better future. Natalie Chanin, CEO of Alabama Chanin, was born and raised in Florence, Alabama, US, which used to be “T-Shirt Capital of the World” until the NAFTA agreement left many textile workers unemployed. She founded a company employing local textile workers to ensure that traditional textiles, such as cotton, continue to be produced using local skills. She also stated that targeted investment in a way that creates quality jobs in which people take pride in their work is key. Natalie Chanin also highlighted, “I feel like there is an emerging kind of business structure where there are CEOs and owners of companies who really believe in higher wages, in governmental rules, [who] provide health insurance to their employees and pension plans, and I feel like there is a future in that”. Carsten Kissmeyer is the Mayor of Ikast-Brande in Jutland, an area of Denmark, where many worked as seamstresses or manufacturers in the textile and furniture industries until these jobs moved abroad due to the impact of globalisation. He mentioned that the Danish government is trying to better understand the impact of trade and globalisation on local areas by moving government offices out of Copenhagen and into the regions. With officials closer to factories and farms, they are able to understand and act on local concerns more effectively. Richard Trumka highlighted that discontent and anger are very common in the United States: “Globalisation is seen to benefit large corporations and not citizens. In the US, half the people say globalisation destroys wages. We have to put their pain and discontent at the centre”. He continued, “The US has never been richer, yet we tell people to take lower wages, less health care, no pension, fewer days off and less time with their family. People are pushing back because they have had enough of it”. The situation has become urgent, as capitalism and democracy are seen as closely linked and young people especially seem to be turning away from both. Richard Trumka referred to research by Yascha Mounk of Harvard University and Roberto Stefan Foa of the University of Melbourne that analyses historical data on attitudes toward government in North America, Western Europe, Australia and New Zealand that spans various generations. 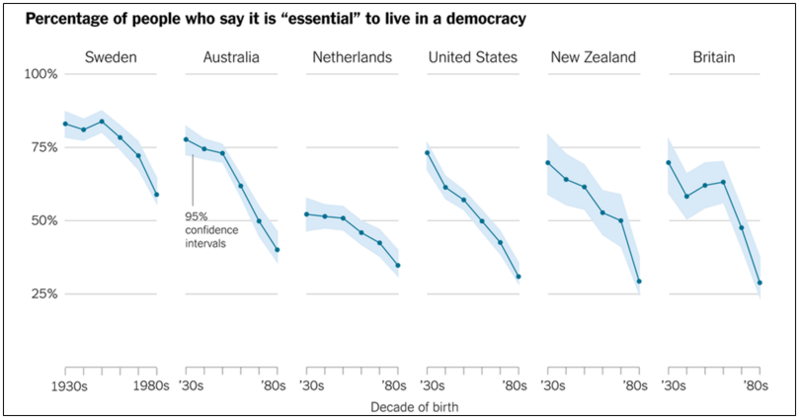 This research indicates that across the board, citizens of stable liberal democracies have grown jaded about their governments, while 30% of US millennials dismiss the importance of free elections and are not averse to other types of government. Often the answer to addressing the concerns of people feeling left behind is that education will give access to better quality and more secure jobs. But Richard Trumka warned that it is not sufficient to find solutions for individual people; viable solutions have to be found for whole groups of people. In response to Natalie Chanin’s more optimistic view of the role that business could play, he mentioned that he does see examples of CEOs ensuring that their workers have access to healthcare and reasonably secure jobs, but again it is important that workers as a whole would be able to access these benefits. 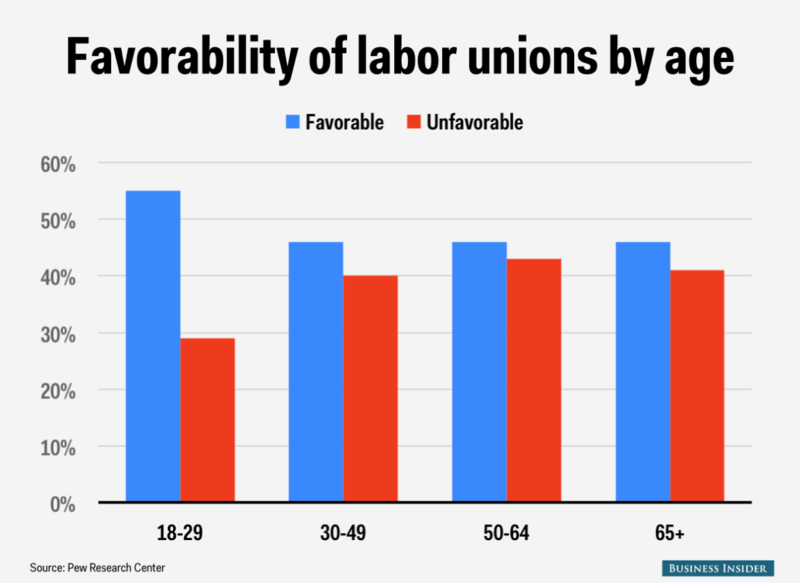 The membership of unions is growing in the US, in particular the membership of young members. Unions are taking on an increasing role of providing access to education and retraining to ensure that union members have the possibility to stay in quality jobs. J. D. Taylor raised the fact that the current generation of British politicians do not understand why those left behind feel such anger: “What we are seeing right now is a crisis of representation, both economic and political. The power of trade unions is really diminished, what was once a check and balance on corporate power has kind of disappeared”. Lamia Kamal-Chaoui, Director of the OECD Centre for Entrepreneurship, SMEs, Local Development and Tourism, referenced OECD work focusing on regional development that has identified the disparities in regional well-being and opportunity for some time. Where you live has a lot to do with how you live, and even how long: “Disparities between localities and regions is not a new phenomenon, but what has really changed is the level of acceptance and tolerance vis-à-vis these inequalities. The geography of discontent is part of this backlash”. She cautioned about focusing just on urban and rural divides because within large and wealthier cities, inequalities are even wider: “We should worry because they are dangerous and can potentially raise more political tension in the future”. So far the response in terms of policy has been at the margins. Even in the response to the crisis, no specific policies addressed these levels of inequality. It is high time that regional policy is given a much more central focus. Natalie Chanin, Carsten Kissmeyer and J.D. Taylor also recommended that governments find a way to talk to people to increase their understanding of local concerns, as this is essential for developing effective solutions.